Another cracking party in October! Big thanks to our guest DJs – N-Kore turned in another jaw dropping set of euphoric psy, Matt Lorraine caused some serious dance floor damage in conjunction with our very own Andi Leppard while Liam Melly in his third appearance for Puzzle treated us to some simply astounding trance music. Thanks to the clubbers who attended who as always were the secret ingredient that made the night that little bit special. It’s with mixed feelings that we announce the last Puzzle Project of 2010. A touch of sadness because we’ll be seeing the back of another great year. Our guests have included some absolutely wicked acts – including Nick Sentience, Lee Osborne, Ben Nicky, Kristian, Liquid Ross, Kali and the much in demand Ali Wilson – and our team of residents has gone from strength to strength, with veterans Phil Lankester and Matt Church winning new plaudits and massive gigs while new additions to the team Ali Cantor, L.K and Andi Leppard have proved themselves firm favourites with the Puzzle faithful. That said, we’re looking forward to seeing what 2011 has in store – which is probably more top DJs and the very best in underground dance music to be found in the Big Smoke! 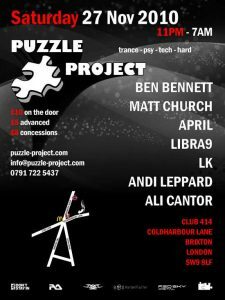 For one month only we are proud to welcome back to the fold original Puzzle Project founder, Impact Records legend and all round top bloke Mr Ben Bennett . Ben left Puzzle some two years ago to focus on other projects, but we thought it was high time to tempt him back behind a pair of CDJs and we’ve finally succeeded! It may well get nostalgic witnessing Ben back in the 414 but rest assured the sly old dog is sure to have a few new tricks up his sleeve. Make sure you don’t miss out! Joining Ben in bringing some harder edged beats to the dancefloor will be our resident Hard Dance princess April! Her cheeky, upbeat and infectious brand of hard dance never fails to flick the right switches and this month will be no exception. 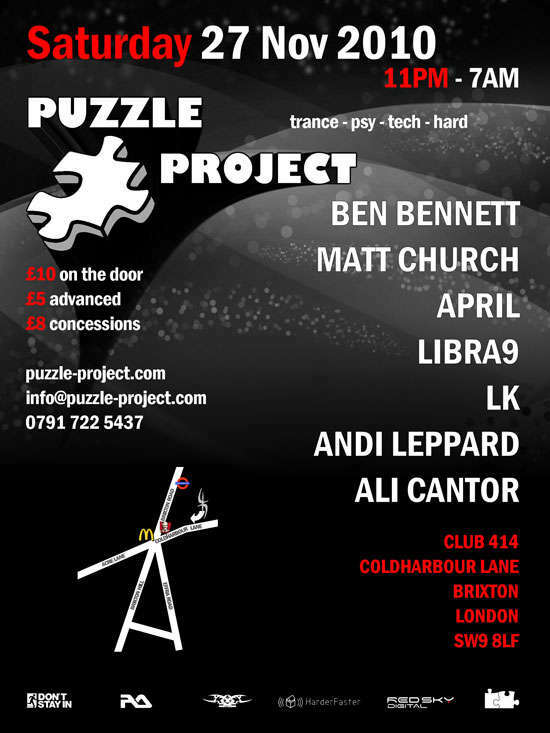 Puzzle Project’s holy trinity of trance will be swinging into action this November as always. Matt, Ali and LK’s taste in trance is nothing if not eclectic, and have proved themselves masters of the art of musical progression from hip shaking housey beats to get you in the party vibe through to funky tech trance and no holds barred driving euphoria for those times of the night when nothing else will do! Don’t miss these three DJs in action – 100% satisfaction guaranteed. No Puzzle line up would be complete without Phil Lankester aka Libra 9, Harderfaster’s favourite DJ of 2009. It’s been another great year for Phil with a soaring profile and a stack of high profile gigs in the bag – and anyone who’s seen this sublime DJing talent in action will know why! Joining him will be fellow homegrown psy star Andi Leppard who since joining the Puzzle team some 6 months ago has proved himself able to rock a dancefloor with the best of them time and time again. These boys will be fresh off the big room decks from the massive Halcyon party the week before so they’re sure to be at the top of their game. 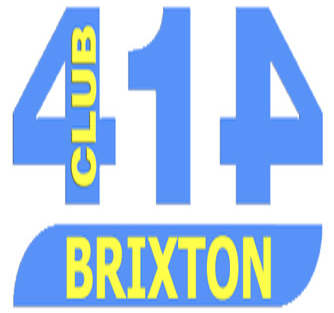 So there we have it – London’s finest team of resident DJs and an unparalleled party atmosphere. There’s simply no excuse not to come out and play and help us celebrate the passing of another great year for London’s biggest small party. Don’t be the missing piece!